The BMW HP2 Sport is expensive and quite rightly so considering this is the finest sporting package BMW have rocked up with. 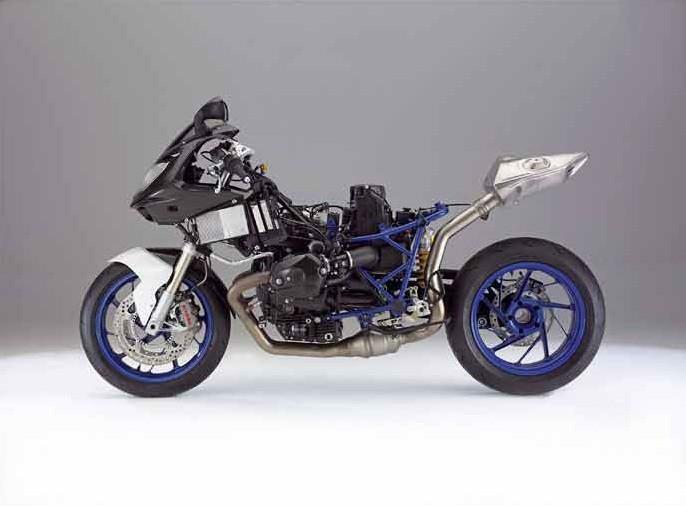 Forget the fact that the HP2 Sport is an old air-cooled Boxer engine that supplies the goods, think more in the way this motorcycle will keep up with Japanese superbikes on the open road because of its handling, suspension and demon brakes. £14,500 is a lot of money indeed – but it is a lot of bike with a serious amount of performance goodies to give big fun at the same time. You won’t believe how ridiculously easy it is to cajole the BMW HP2 Sport though hairpins and fast sweepers. 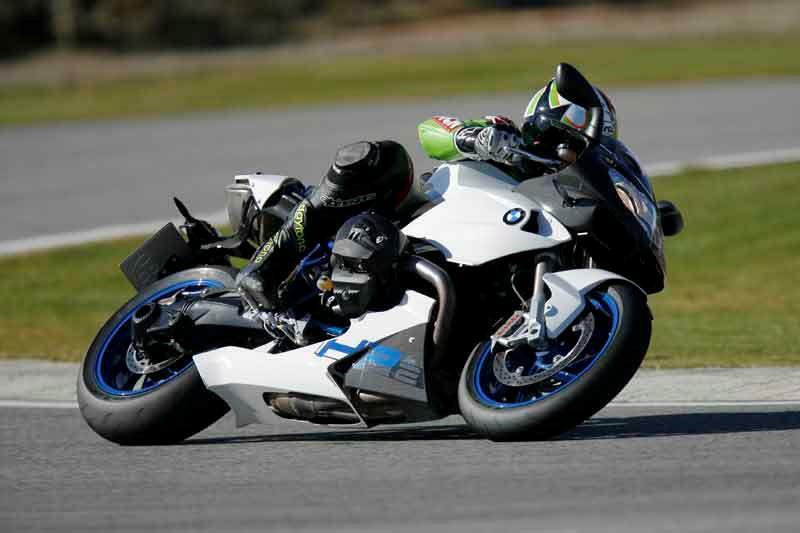 While the handling can be described as fast and light (agile), it remains as stable as the R1200S it is based on. Seriously, you can brake late and hard and the Telelever front end combined with an Ohlins shock absorber keeps everything shipe shape. 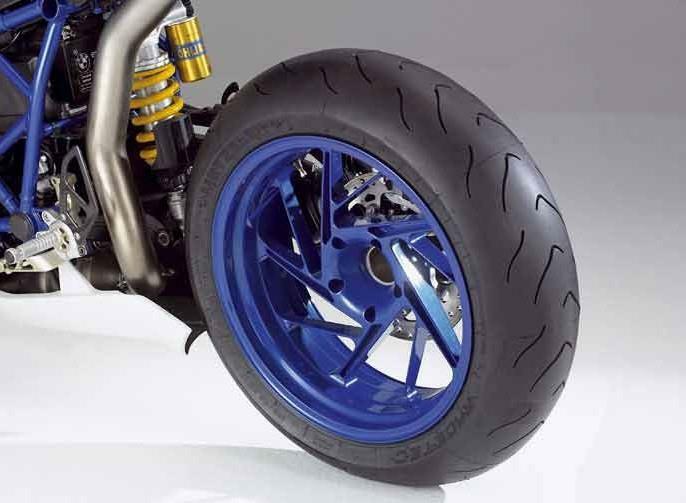 An Ohlins shock at the rear does exactly the same perfect job of keeping the rear end in place at any speed or angle. 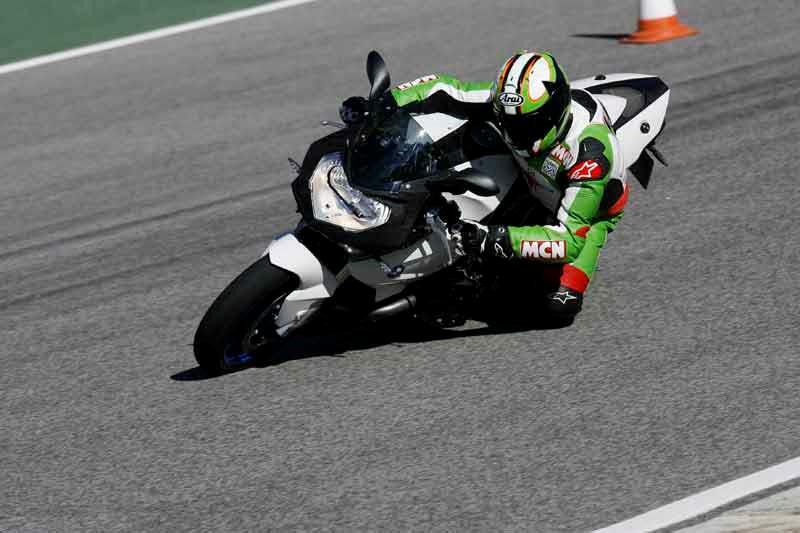 Not only does it make a brilliant road-going bike, the BMW HP2 will cut up rough at track days. Based on the R1200S engine, the BMW HP2 Sport gives up a claimed 128bhp at the crankshaft to make this the most powerful Boxer engine ever. The power figure comes from a higher rev ceiling thanks to a new four-valve, double-over-head-cam design and lightweight pistons and superb electronics. Put this all together and you get a punch-laden lump that will hit high 120mph all day every day – and sound good from the underslung exhaust system. Gear ratios are revised enough to ensure the front wheel will loft in first gear and keep the engine on the boil at the top end of the revs. Five out of five rating for this section might seem strange but you have to remember BMW ran the same model in the later stages of the World Endurance Championship without a problem – 24 hours of Bol d’ Or hell at the Magny Cours circuit is a tough test for a bike. The race bike ran with the same engine, ECU and airfilter as you get with the HP2 Sport. 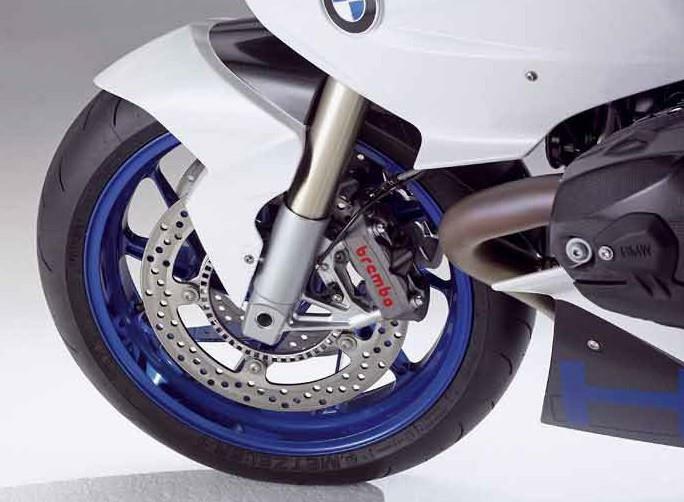 When you consider the BMW HP2 Sport comes with every desirable component we’d all like to have on our own motorcycles eg Brembo brakes, Ohlins suspension, then the £14,500 price is not so hard to swallow. To BMW purists this is the best, sportiest BMW ever and may be considered priceless. MCN is not alone on this line of thought because most of the 95 bikes UK bound for 2008 are pre-sold. Find a BMW HP2 Sport for sale. Although the HP2 Sport is a BMW there are no panniers to talk of – there is, however, an accessory tank bag. 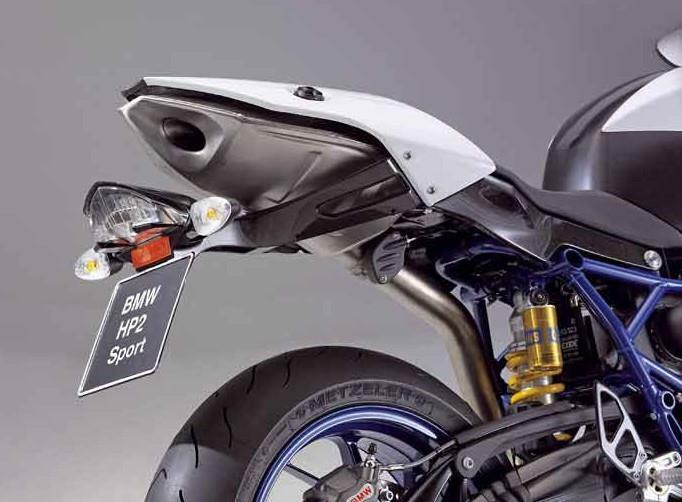 Instead what you get with the BMW HP2 Sport is the best of everything: Ohlins suspension, perfectly formed carbon fibre rear subframe, front fairing stay, upper fairing, front fender and more. 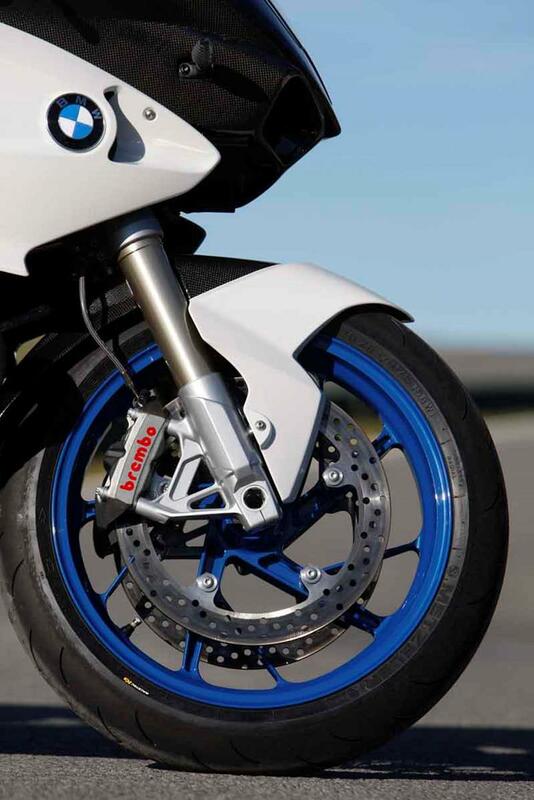 Brembo race-spec Monobloc front calipers and lightweight forged aluminium wheels laced with Metzeler race compound tyres are just some of the other choice parts. 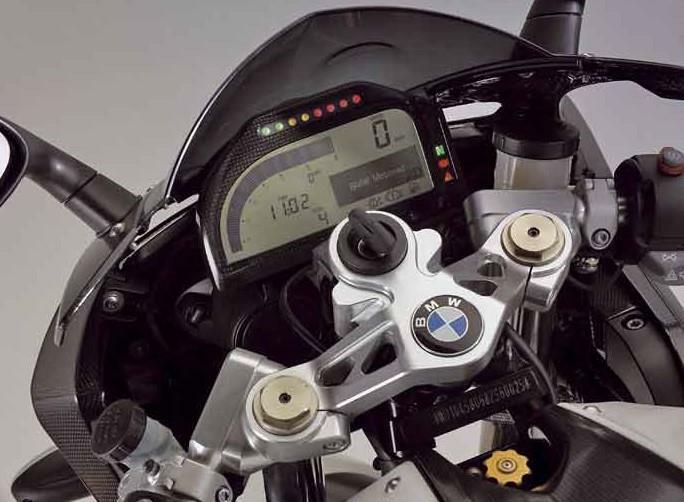 The HP2 Sport is also the first production motorcycle to carry a quick shifter as standard – fitted in-line of the gear lever to cut the spark and fuel injection for clutch-less shifts. Compare and buy parts fot eh BME HP2 in the MCN Shop. 2007: BMW HP2 Sport launched. Goes on sale 2008. 4 owners have reviewed their BMW HP2 SPORT (2008-2012) and rated it in a number of areas. Read what they have to say and what they like and dislike about the bike below. The best road bike I have ever owned. The most accomplished and comfortable sportsbike bar none. Ride quality is excellent though the front OEM brake discs & pads could be better. Discs can warp after about 15,000 miles. I would recommend Super Sport discs & pads at this stage to match the excellent Brembo M4 callipers. Pure joy. 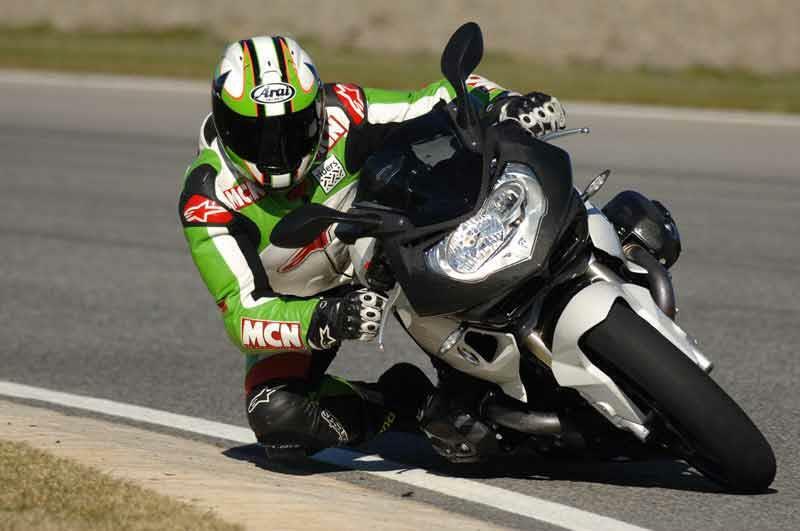 Perhaps only the performance of a Super Sport bike but the way it delivers the power is awesome. You will not find a better quality motorcycle & it hasn't missed a beat in 5 years of ownership. Reasonable servicing costs apart from a major engine rebuild which is required at 30,000 miles, hence the drop of a star in my rating. Brembo brakes, Ohlin suspension all around, carbon everywhere, billet rearsets & a beautiful sounding exhaust as standard. I have had my HP2 Sport for a year now. Bought it at a year old for £10,999 with just 1,000 miles on clock. I have had a blade,R1,Gixer thou, ZR10 and Rsv factory and I have to say this is the best overall package for the road I have encountered. My only slight critiscm is that it could do with another 10 horses and torques throughout the range and a beefier exhaust note (for passers by). I would say at present it drives out of corners better than a jap four, but loses out a little on mid - upper rev range. The bike sounds mega when you are on it, especially popping and farting on the over run, but sadly it is far too quiet for any audience. If an Akrapovic system was not £2.5k but a more reasonable price I would fit one tomorrow to resolve the 2 issues above. It is a BMW oversight not to fit a carbon rear hugger as all the road debris flies straight for the Ohlins shock...got one from Hornig in Germany. Overall I would urge any potential buyers of Jap 4's to take one of these for a long test ride before parting with your cash. This is the best real world sports road bike and you do not have to clean and lube a chain every other week !!! Dealer 2nd hand prices are now good. Only other bike I have ridden that is as good is a 1198, but not as comfortable, even more useless mirrors and large turning circle when parking and your hands hit the fairing, but lovely motor and sound ! but still £2-3k more expensive!! Recently picked up my HP2 Sport and wow what a bike. I have owned Blades / R1's / ZX10R's so know what I wanted from this bike and have also owned R1100ss so hoped it would be a lighter, faster more capable BM. Well I was not disappointed. The build quality is fantastic with machined parts and top name components everywhere. The carbon fibre quality is awesome. It handles superbly changing direction easily and is very forgiving if you barrel into a corner too fast. It can carry great corner speed and has immense torque so you can fire out of bends. The sound from the exhaust is wonderful and it makes lovely popping sounds on the overrun. Acceleration is really much better than I expected and the quick shifter means you can stay with the top jap sports bikes easily, and can even pull away out of corners. 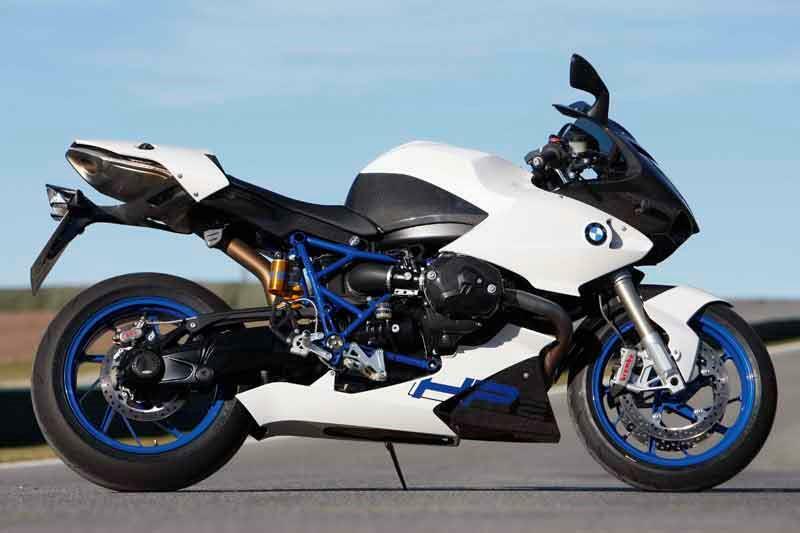 The cost seems expensive until you remember that a 'normal' BMW has minimal depreciation and this is a very limited production bike, so expect it to hold value really well. Its also easy to see where the money has been spent. You actually start to wonder how they could provide so much carbon fibre and so many top spec components for the price... And if you would like something a bit rare, this is the baby. It draws a crowd wherever I go. I actually think the bike looks a little bland with the white painted carbon fibre bodykit and plan to paint mine to match the le mans winning bike. It would have been better if BMW had left the bodykit in plain carbon fibre finish. The suspension is far too harsh on standard settings with too much pre-load. The static sag desperately needs setting for you weight and the damping adjusted for the roads you ride. It transforms the bike leaving you with a stable mega-fast real-world superbike, while your friends struggle to keep your beautiful one-off exhaust in sight. I got mine within 2 weeks by emailing every BMW dealer asking them to contact me if they received a cancelled order. Do whatever you have to do to get one of these bikes...rob a bank or sell the wife...whatever it takes! Had a R1200S which I loved, so took my chance and ordered an HP2 sport before I even saw a picture, thinking it must be better. To say I was not disappointed is an understatement. No matter where you look it is very special and then when you ride it, it gets even better. 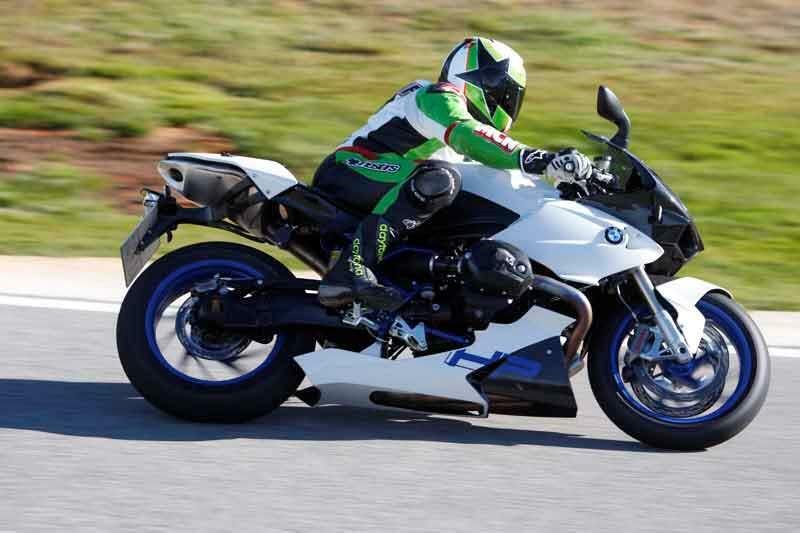 It handles and goes like a sport 600 with grunt, much more so than the R1200S, which you have to work much harder. It is so stable when cranked over it just asks you to open the throttle up that little bit more – on smooth A roads and rough B roads, which is remarkable. It seems to change direction with thought alone and the brakes are full of feel are very stable. As for the toys; the dash will keep me busy for the next few months trying to work it all out, but the best toy is the quick-changer, so long you don't use it on a closed throttle and you remember to keep it open. It really does help you make smooth rapid progress but the ‘pop’ sound it makes as you change gear is reason enough alone to use it – its fab. The down side compared to the R1200S is that it’s not as comfortable, the seat is harder and the bars are lower, but still much better than most, similar to the RC8, which I had a test ride on. However the mirrors are a real joke – you cannot see behind you without climbing out of the seat, which is dangerous, so I will look to change this. I love this bike. It’s a true work of art, exclusive, rapid, fun and still quite comfortable – what more can you ask.